The following ashtrays use filters to remove smoke. Clean air emerges from sides of ashtray. Make sure you always have extra filters on hand. Powerful and quiet motor draws smoke into the two replaceable super absorbent activated carbon filters, removing smoke and odor. This is the perfect smoking accessory to hold a lot of cigarette butts. 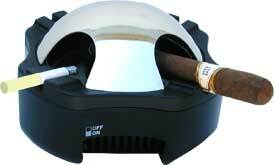 The easy clean Bakelite ashtray insert is heat resistant and dishwasher safe. 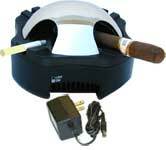 Great for cigars too. Comes with stainless steel cover. Uses A/C adaptor for household current (sold separately below) or purchase the CEO Package below which includes the A/C adaptor, or 4 "C" batteries (not included). Includes 4 extra filters. Comes with stainless steel cover. Uses the included A/C adaptor for household current or four "C" batteries (not included). Includes 4 extra filters. A pack of four (4) super absorbent activated carbon filter for CEO smokeless ashtray. Wall Transformer -- No need to buy batteries, get an extra wall transformer for every room you want to smoke in. How about one for work?